Thank you for the feedback on the mobile post. I thought the post would look different than using my mac to post but, at least on Safari, there is no difference. I downloaded TypePad for Windows Mobile 6 to the phone and it was very easy to use. The photos were taken using the phone camera and look pretty nice. I used the camera's mosaic feature and just snapped pictures of a few things with no real theme in mind. In the upper left photo is of a partially consumed bottle of Fiji water. I had a bottle this past summer when I was in Kansas during the "don't drink the tap water" problem. I really liked it so I drink it regularly...perhaps I am silicon-deficient so it tastes good to me. There is also the Spring 2007 Spin-Off (good eyes, Stacey! ), and one of the walkie-talkies we use at home so we don't have to holler. The walkie-talkie is in action since DH came home sick Thursday morning after being struck with the flu on Tuesday evening in his hotel room up north. I'm doing my best to be helpful to him but not catch the bug. Cross your fingers for me. The lower left photo is a close up of the embroidery on the bag my brother brought me from Costa Rica. It is going to be a great knitting project bag. In the upper right photo is my aloe vera plant. Everyone should have one in case of getting a burn. It really helps your skin heal quickly. A closeup photo of my first hank of handspun is in the lower right. 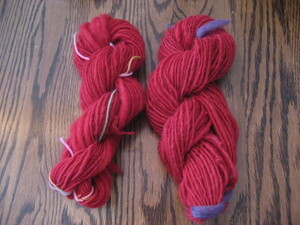 Thanks, Kim, for the comment that it looked like Malabrigo; you really pepped up my day. The fiber is wool but, what variety, I don't remember. I know I purchased it in a "learn to spin" kit from Miekle's Farm at the Wisconsin Spin-In when it was held in Oshkosh, Wisconsin, several years ago. 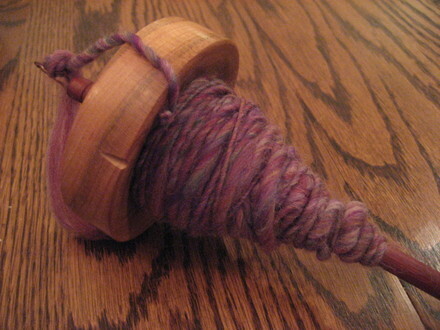 I spun a full spindle then set it aside. Time passed. *ahem* The fiber suffered a flood and a summer in a sunroom. Then I spun a bobbin of the rest of it on my wheel. The spindle yarn (multi-colored ties) was 65 yards and weighed 45 grams while the wheel spun yarn (purple ties) was 49 yards and weighed 58 grams. The last photo is after I soaked the yarn (set the twist, hopefully) and thwacked it against the side of the shower, then let it hang with a weight to dry. I'm leaving them as singles. I cleared the spindle and bobbin just to get the yarn finished, you know? Yes, it has been years. Here is the results of yesterday's spinning. I'm feeling a little disappointed that my skills have regressed but that's my fault. 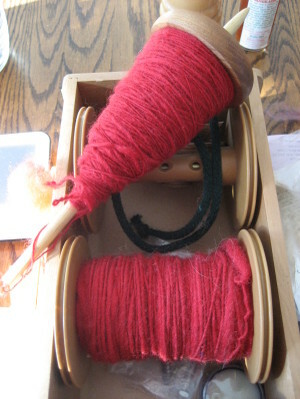 Frankly, the singles don't look too bad on the spindle for not spinning anything for, oh, over a year...maybe longer. And I was just a beginning spinner at that point. (No argument there, heh.) NaSpiMoMo is going to be good for me. (translate that as: I'm going to spin and I'm going to like it!) Today I'm going to search out another spindle and see if it is me (more than likely) or the spindle (also possible). There are three more days left of my vacation plus the weekend. Today I'm going to work on the laundry monster which isn't too bad since DH and I have been lounging and not dirting street clothes. The Christmas tree is on my list of things to pack up and store. I'm still feeling lazy enough to leave it up but if I don't do it this week, Valentine's Day decorating may be challenging. 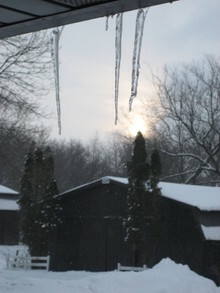 The sun attempted to make an appearance this morning. 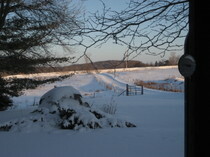 Although it showed up for what seemed like a brief moment, it was pretty through the light snow and haze of clouds. 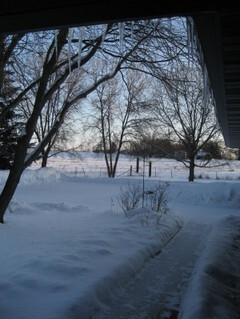 A nice start to the new year, I think. DH is still under the weather with his cold or whatever. He usually toughs his way through colds but this one has really sapped his energy. 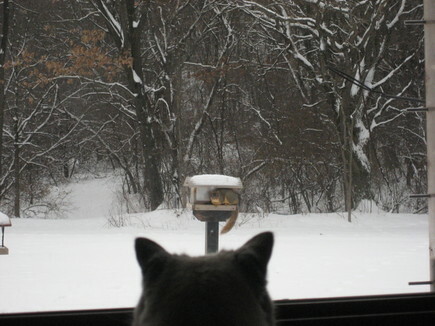 I really hope I don't catch it. He has been (really) pretty easy to care for unlike the guy in the clip at Norma's today. If you haven't seen it yet, it is very funny, especially if you are a female. Today Jen and La published their Fourth Annual JenLa Knit Blog Awards. Purling Oaks won the Home Away From Home Award!!!!!! Whooooo! I was so surprised to see this blog listed when I read through the awards this morning. Thank you, Jen and La!! I'm participating in NaSpiMoMo this January. I plan to spin everyday, if only for a short while, even if I'm traveling. I haven't spun in a long time and my wheel and I are barely acquainted. So this will be a good opportunity to develop my spinning skills some more and maybe even produce some yarn. *HA* This is where I'm starting today. 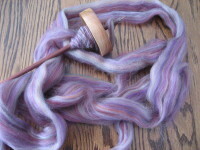 I'm using a Nina dropspindle and merino top that I purchased from the Weavers' Cottage when I was visiting my brother in California. It's been in the bag for *ahem* over two years now, so it is about time I spun up the fiber.